On Saturday night I went out to the Nuart to see John Sayles’ new movie, Go for Sisters. It’s a moving story about a mother who goes to Mexico looking for her kidnapped son. She’s accompanied by a friend, a former addict who’s trying to get back on track, and the two of them join up with a former cop who helps them navigate the streets of Tijuana. 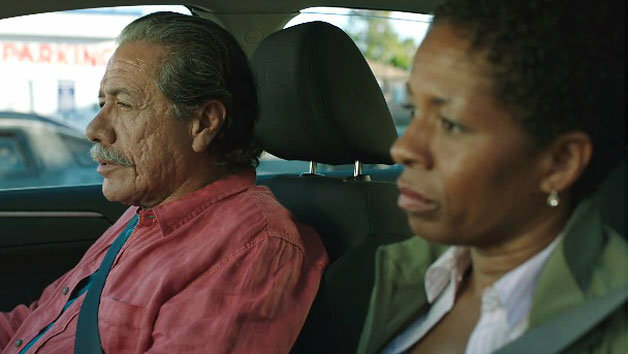 As you would expect with Sayles, the screenplay is excellent, and the performances by LisaGay Hamilton, Yolonda Ross and Edward James Olmos are first rate. It’s a tough, tense little movie that really digs into the characters. Sayles has been around since the seventies, shunning the bright lights and big bucks of Hollywood in order to do things his own way. He has doggedly pursued his goal of making honest movies, and as most independent filmmakers will tell you, this is always an uphill battle. After the movie was over, Sayles was joined by Hamilton and Olmos to take questions from the audience. During the session, Hamilton asked the audience to help get the word out, and that’s the reason for this post. Go for Sisters is getting very limited distribution, and the filmmakers have very little money to promote their work. They need our support. They deserve our support. The link below will take you to the web site, where you can view a list of dates and locations. If you want to see a real movie about real people, check it out. Posted on November 19, 2013, in Uncategorized and tagged Edward James Olmos, John Sayles, LisaGay Hamilton, Yolonda Ross. Bookmark the permalink. 1 Comment.